Army Spc. 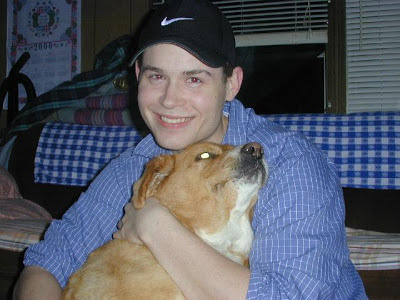 Jesse Conger - Run for the Fallen New Hampshire, Inc.
22, of Barrington NH; died in a military training accident when his cargo truck rolled over. Jesse grew up in Barrington NH, where he lived for 18 years. He attended Barrington elementary schools and graduated from Dover High School in 1998. He enjoyed computers and soccer. He is remembered by family and friends for his exuberance and go for it attitude. His mother, Ann says he gave up a well-paying job in computers to join the military, because he wanted to serve his country and see the world. He was known for his curiosity, his eager enthusiasm and for always running a little late. "Boy oh boy, he was all boy," his mother recalls. "He lived on the edge of everything. He was always five minutes late and he always said what he thought. His attitude was, 'Let's do it!' "
From an early age, he showed a keen interest in computers and technology. After high school, Jesse sold computer systems on commission and made a very good living. "He was such an astronomical salesman, he could talk anyone into buying anything," Ann said. "He was an incredibly inquisitive kid, and the Army was something new for him," said Ann. "When he got off the plane from basic training, he looked like he'd just fought World War II by himself. He was so stunning and so proud.". "He loved that life more than anything," she said. "He wanted to serve, he wanted to do all the things they do. This was his second trip up to the Yakima mountains and he was pretty excited about that." She also said his service commitment was up in July (2002)and that he had planned to settle in Washington. "God gave me Jesse for 22 years and I thank him for that," she said. When he joined, his father Jeffery was curious why. "When anybody joins the armed forces, they all take an oath to defend the Constitution to the death," said Jesse's father, Jeffrey Conger. Jeffrey also served in the Army and was in Germany for the construction of the Berlin Wall. He recalls Jesse simply said, 'It's time.'" Jesse gave his father a letter after he enlisted. In it, he said things to his father that were "easier on paper." "I wanted to say that you are the best dad a guy can wish for," Jesse wrote. "PS: I didn't join the Army for any other reason than to better myself, and to make my father proud." 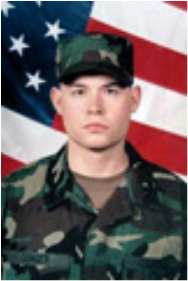 Jesse entered the Army in August 2000 after attending basic and advanced training at Fort Benning, GA. He was an member of the elite 2nd Battalion, 3rd Infantry Regiment of Fort Lewis. In November of 2007, Jesse's s name was added to the Global War On Terror Monument that stands in front of Hampton's American Legion Post 35 honoring those soldiers who lost their lives in service since Sep. 11, 2001. Air Force Staff Sgt. Thomas Moore who grew up chasing frogs with Jesse, presented Jeffrey and Ann Conger with his security police badge during the ceremony. The badge symbolizes his duty to protect and serve, he said. "I looked up to Jesse and he protected me," Moore said. 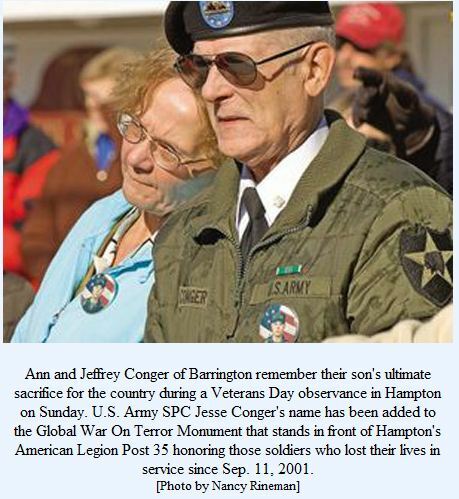 On Memorial Day 2009, the bridge in Barrington spanning the Isinglass River on Route 202 was renamed the Specialist Jesse Conger Memorial Bridge in his memory. A special ceremony began in Pine Grove Cemetery off Route 9 that afternoon, where family, friends and members of Rolling Thunder veteran's advocacy group gathered to remember Jesse and what he gave for our country. Donations may be made in his name to the Eastern Paralyzed Veteran’s, 7 Mill Brook Road, Wilton, NH. He is survived by his father and mother Jeffery S. and Ann Conger of Barrington; his brother, Donald L. Conger ; his grandmother, Maria Lechinsky and his extended family.